By the way, for the non Irish folk, it’s Phoist because that’s what you see there on the sign but with the older script having the dot above the “p” performing the same function as the modern “h” (It’s called aspiration). and the noose is for… ? for when you miss the post, and it really really, matters. On one or two trips around Ireland, I traveled with my roommate who speaks a number of languages. 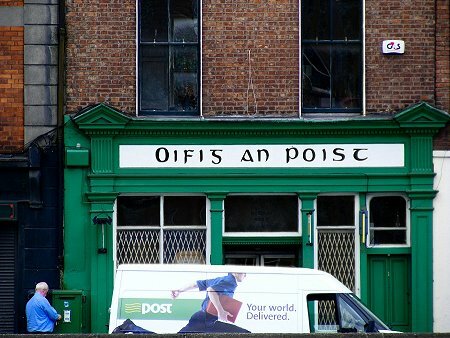 The only Irish she remembers from the trips is ‘Oifig an Phoist’ (post office) and ‘Failte go Gort’ (Welcome to Gort). She didn’t believe me when I first pronounced them for her (and I thought I did pretty well). The sounds of the words still make her giggle. She’s learned a number of languages but thinks that Irish would be hard to speak without losing her composure, so she’ll stick to Russian. I asked her if the words meant something rude in Russian, but she laughed and changed the subject so I’m suspicious.